FUZZY WUZZY Some pterosaurs (an artist's rendition of one shown) may have had a furry body and feathery wisps along the tail, head and wings. 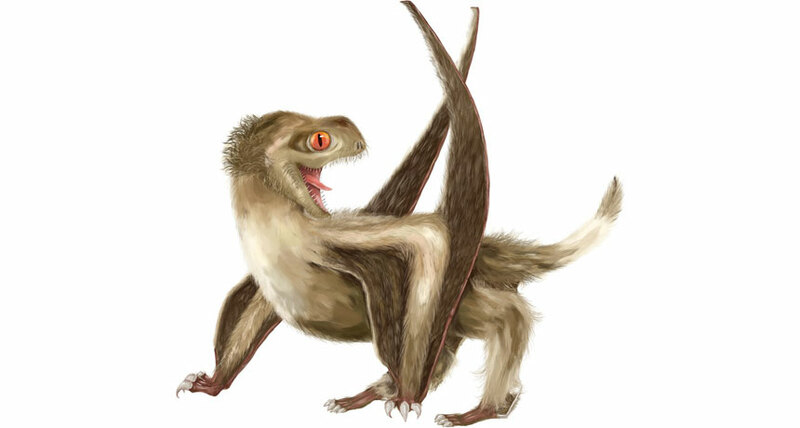 Think of pterosaurs, the flying reptiles that were distant cousins to the dinosaurs, and you may imagine a fearsome, leathery, winged creature. But new fossil evidence suggests at least some pterosaurs were soft and fluffy, covered in a diverse array of fibrous structures including possible precursors of feathers, scientists report online December 17 in Nature Ecology & Evolution. The discovery adds to a growing body of evidence that featherlike structures may have been more common during the time of the dinosaurs than once thought. Researchers led by paleontologist Zixiao Yang of Nanjing University in China identified four types of filaments called pycnofibers on two fossil pterosaur specimens, both dated to around 165 million to 160 million years ago. One of the pycnofiber types was a single, smooth, filament that covered the bodies of both animals and may have kept them warm, like fur. The other three types, however, all showed branching structures extending out from a central filament - a key feature of feathers, the researchers say. Scientists identified four distinct types of fibers preserved with a pterosaur fossil. One type (green) was a single, smooth fiber that covered much of the animal's body, and may have resembled fur. The other fibers (brown, red and blue) appear more featherlike, with branching structures springing from different parts of a central fiber. Those fibers were found only on certain parts of the specimen's body, such as the head, wings or tail. Until recently, scientists thought theropod dinosaurs, the lineage that includes Tyrannosaurus rex as well as the ancestors of modern birds, were the only dinosaur group to have anything resembling feathers (SN: 5/5/12, p. 9). Then came the discovery of hairlike filaments preserved with fossils of Tianyulong confuciusi (SN Online: 3/18/09), and even more complex featherlike structures preserved with Kulindadromeus (SN: 8/23/14, p. 15). Both species fall on a different branch of the dinosaur family tree, the ornithischians. There also have been hints of hairlike or even featherlike structures in pterosaur fossils. But evidence for branching filaments was inconclusive. It's not yet clear what the discovery that these pterosaurs had diverse, fuzzy coats might mean for the big picture of feather evolution. The pycnofibers may have evolved independently in pterosaurs, as an adaptation to keep the animals warm or for better aerodynamics. But, more tantalizingly, the filaments may have had the same evolutionary origin as actual feathers. If true, that could mean that the common ancestor of dinosaurs and pterosaurs had feathers of a sort - making the origin of feathers even fuzzier.